I’d like to begin by saying I’m completely biased towards this mosaic because of the Sapphire Blue – it’s one of my favorite colors and is a spitting image of the jewel tone. 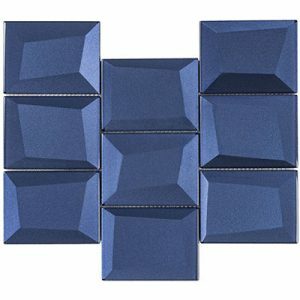 But enough about the Sapphire tone, this collection has 6 other awesome colors. There is a great silver gradient, a soft gold and bronze, and a striking black. So, what does this glass have that’s so special? 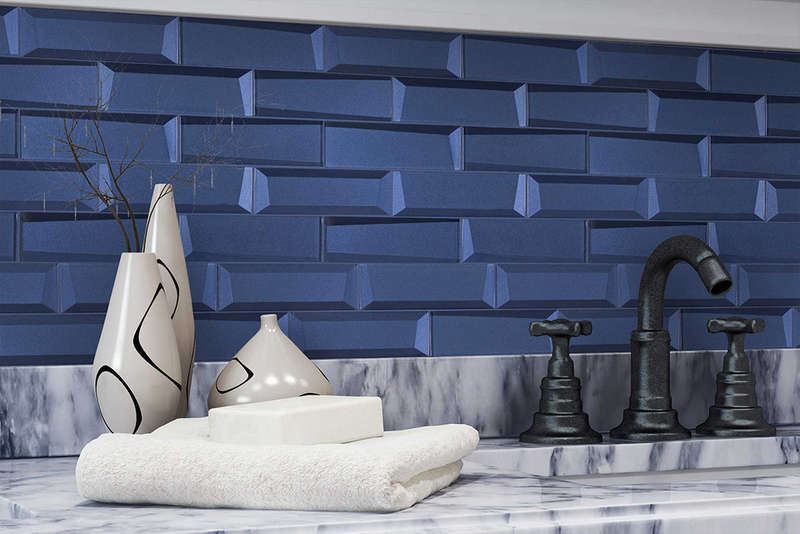 The line and hex mosaics are contemporary twists on traditional shapes. 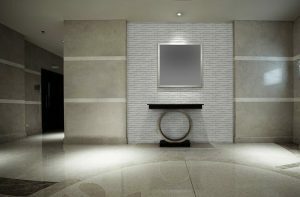 The line mosaic is a new take on a beveled brick, the angles or bevels are on the back side instead of the face. The hex mosaic captures a mix of dimensionality, contrasting finishes and d textures – matte, clear and raised glass, and striated and beveled back textures. This tile begs for some illumination, whether it’s under cabinet LED lights in a kitchen, or some wall washers grazing the tile on a feature wall. The subtle shimmer embedded on the backside of this tile is as described… subtle, but when light is introduced, the tile shines bright… like a diamond (Ok, I know a couple Rihanna songs). The light bounces off the facets in the line and the contrasting finishes and textures of the hex — it really takes this tile to the next level. Want to see the brilliant effects of the outlast collection yourself? Request a sample and shine your cellphone light over it! The palette is quite simple — gray and dark grey, available in 2 large formats, 24″ x 48″ and 8″ x 48″, and budget friendly! I love this tile format because it allows for less grout joints, which is a goal for this aesthetic. It also allows for the board-form texture to flow nicely from one tile to the next. I can’t think of an application where this tile can’t be used… well, maybe there are one or two, but you get the point, this has a lot of uses. If your design needs a minimalist look for the floor, this is a great option — it won’t compete with other finishes. If you’re looking to create a pattern with a concrete aesthetic, these sizes allow you to create unique patterns. Pattern designs and layouts are one of many great services we offer at Creative Materials. Contact us to request a sample of Oxford.